The welcome screen appears to let you know you are connecting to a secure service, it is part of our data protection requirements to display this and recognized industry best practice for any remote access to computer systems. 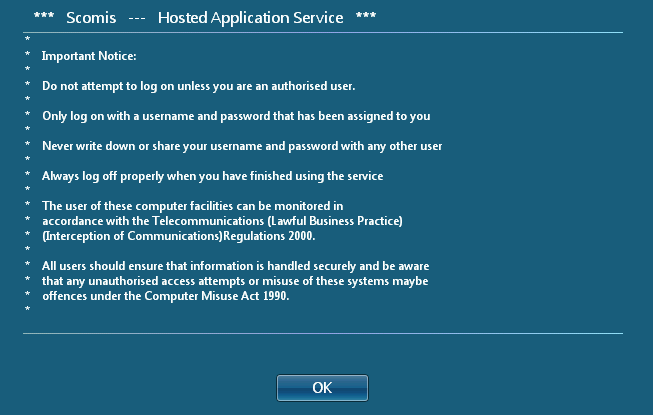 When connecting to the Scomis Hosted Application service you may see the welcome screen twice. You are connecting to a load balanced server farm, if you see the welcome screen a second time it is because either your connection has been redirected to a less busy server or you had a disconnected session and you have been redirected so you can continue where you left off. Posted in Connector, Driverless Printing, Hosted Apps, Services and tagged connector, Scomis Hosted Apps, twice, welcome.